You get an additional 20 stock or membership Certificates for your corporation or LLC. Printed with your company name. You simply type in the number of shares or units the certificate represents, sign & stamp. Postage included. NOTE: Each Corporate Kit automatically includes 20 stock certificates. 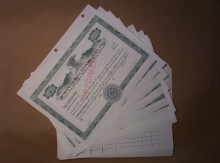 Each LLC Kit includes 20 membership certificates.